Feeling a little burnt out by Fortnite? Sick of seeing Ninja be a million times better at it than you? Well, Realm Royale, the new battle royale game from Hi-Rez Studios has entered free-to-play Early Access on Steam. Players begin each round of Realm Royale by selecting one of five traditional fantasy classes. Each class offers a unique playstyle; Mages can soar above the battlefield and rain down fireballs, while Engineers deploy turrets and shields in hero shooter-style combat. “Realm Royale’s class-based, ability-driven combat brings a new experience to the battle royale genre,” said Rory “Drybear” Newbrough, Realm Royale Executive Producer. It’s a battle royale that feels like the perfect mixture of an open-world PvP MMO and your favourite hero shooter. Each round unfolds in true battle royale style, with 100 players dropping from a zeppelin into a massive fantasy-inspired map full of goblin villages and mushroom forests. Players loot weapons and abilities from chests as the fog closes in, customising their character and effectively creating their own personal champion. In another fantasy twist, players are able to summon a mount at any time to quickly cover open ground and get right into the action. Realm Royale’s Squad-focused design adds to the excitement as players join each match as part of a four-player team working together to win the Crown Royale. The classes are designed to support one another, with Assassins planting Sensor Drones to scout for their teammates, while Warriors can toss Shielding Potions to protect squishy Hunters. Forges located throughout the map become focal points for conflict as players craft unique Legendary Weapons, fight for control or look to stealthily steal weapons, driving action throughout the match. “You can’t win a round of Realm Royale by hiding in a bathtub,” Newbrough said. Gameplay elements like Forges reward players for staying active and taking risks. 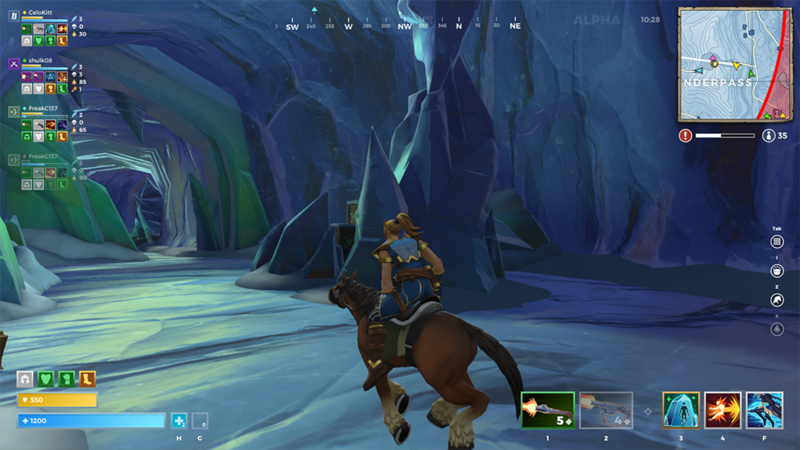 Realm Royale started development as “Paladins: Battlegrounds,” announced in January at the annual Hi-Rez Expo as a new mode for the hit hero shooter Paladins. After seeing positive feedback to the mode’s announcement, Hi-Rez Studios spun off Realm Royale as a standalone game with a larger scope. To download Realm Royale and play free now, visit www.RealmRoyale.com or https://store.steampowered.com/app/813820/.